Amazon Price: $179.99 $92.28 You save: $87.71 (49%). (as of – Details). Product prices and availability are accurate as of the date/time indicated and are subject to change. Any price and availability information displayed on the Amazon site at the time of purchase will apply to the purchase of this product. Featuring kill zone range finding capabilities and variable power magnification, the Sightmark core SX 1.5-4.5×32 crossbow scope is the ideal crossbow scope for medium-sized game such as Whitetail deer and Mule deer. This scope accomplishes arrow drop compensation for exceptional accuracy and precision aiming. Its 1.5-4.5x magnification is tuned to 250-400 FPS crossbow speeds. Equipped with a Red/black VXR-M reticle and 11 brightness settings, the core SX 1.5-4.5×32 adapts to a wide range of hunting environments. The scope features fully multi-coated optics, low-profile capped turrets and a fully weather proof body for exceptional dependability rain or shine. 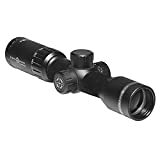 Specifications: – reticle color: black and Red – lens material: glass – diopter adjustment: +3 to -3 – reticle: etched – body material: aluminum – field of view (ftat100yd): 84.3 – 28.1 – reticle type: VXR-M – IP rating (waterproof): IP66 – weatherproof and dustproof – field of view (mat100m): 28.1 – 9.4 – battery voltage (V): 3V – eye relief: 88.90-76.2/3.5-3Mm – battery life (hours): 25-1000 hours – exit Pupil diameter: 21-7mm – battery type: CR3032 – eyepiece diameter: 39mm – maximum recoil: 800 – objective lens diameter: 32mm – weight: 16oz – MOA adjustment (one click): 1/2 – magnification: 1.5-4.5x – dimensions mm: 242 x 66 x 38 – elevation adjustment (MOA): 80 MOA – finish/color: matte black – operating temperature (F): 0 to 120 – Parallax setting: 30 yds – brightness setting: 0-11 – lens coating: multi-coated – tube diameter: 25.4mm/1in. Domestic Shipping: Item can be shipped within U.S.
Fujinon 25×150-MT, Weather Resistant Porro Prism Binocular Telescope with 2.7 Degree Angle of View. Fujinon 12 x 40 S1240D Stabiscope, Weather Resistant Porro Prism Gyro Stabilized Binocular with 4.0 Degree Angle of View, U.S.A. Copyright © 2019 Camera and Optics. All rights reserved.